Here we see a hand reaching out from a cloud which is holding or offering a chalice or cup. Water springs forth from deep within the Cup and cascades like a waterfall into the calm blue sea below. The waterfall represents the overflowing or gushing forth of positive emotions. A dove flies down from above and enters the Cup or Chalice with the blessings from Spirit above. The clear sky suggests a trouble-free time of peace and harmony with nothing troubling on the horizon. 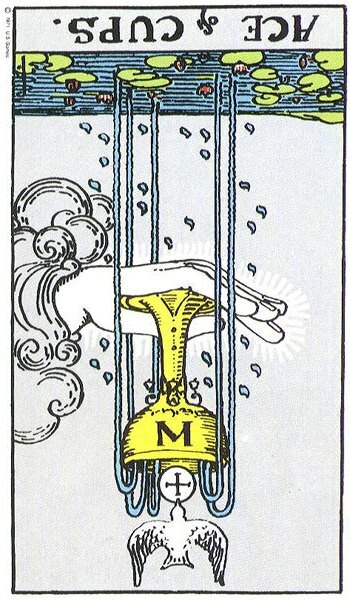 The sky’s pale blue colouring symbolises the spiritual aspect and nature of this card and its governing element Water. There are pink and white Water lilies or lotus flowers resting in the calm blue sea. Some of these lilies are open while some are still in bud. This suggests that even though this period of happiness appears abundant, there is still room for more growth and development. This card is so positive that it speaks of even more happiness and love to come. The Ace of Cups brings the potential for a deep contentedness within and without. It heralds a period of calm and balance in your life. Thank you for this absolute spot on Tarot……I now have clear clarity of the past three years loosing my eldest daughter Jacky and my youngest daughter Linda…..I have no natural family to support me emotionally so it’s been tough……….all I did was read inspiring,uplifting,spiritual material. I am a Medium so that also helps…..with both losses I was very mis-used and betrayed by family…..but I forgave them and I move on……I’m single and am so by choice because i cannit share my space plus my Numerology tells me “my field of opportunity is when I learn to stand alone….blessings to you and very big prosperity….. I am happy you are getting so much from my site. That is what keeps me writing. Life can be very tough and I often wonder why so much pain and suffering? Like you, I also read many spiritual works when my son was dying from cancer. The book I felt most comforting was The Tibetan Book of Living and Dying. I read the Living part during his early hospital stays. I read the Dying Part when he was home under palliative care, and at the end when he was back in hospital. I would sit beside his bed and read. I really think it supported me through some very dark days and nights. I still have it and in my own pain and poor health now, I feel I must return to it and remind myself of its very simple message of impermanence. Peace and Comfort to all of us. I love your site & all the descriptions! It allows me to be able to understand concepts, meanings on every level! Thank you so much for your diligence. I respect your work! I read with pleasure your lovely description for the Ace of Cups. I’m a Tarot reader and spiritual life coach and this is my card today. I stopped by your site because I always find it enhances my understanding to also by listening to other readers’ interpretations. You confirmed my understanding. Love, light, healing and blessings to you. Thank you. 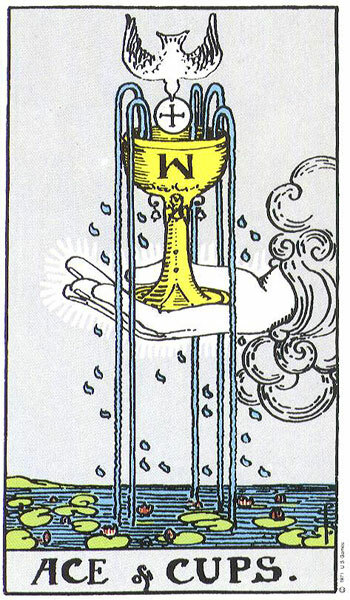 The Ace of Cups is always a lovely card to get. Blessings to you too. Thank you so much! I am just trying to understand how this card reversed can translate to the description of a future life partner . It came up in my love reading and I am just wondering . Can you help? Yes, maybe not the card you would expect or even desire. The Ace of Cups reversed can suggest emotional disappointment, unhappiness or upset. It can also highlight being overly-idealistic or getting overly-emotional about things. If you are being too idealistic about your future life partner, expecting too much of one person, The Ace of Cups Reversed could be warning of setting yourself up for disappointment as potential partners fail to live up to your ideal of the dream partner. You might also need to address what it is that motivates you in the search for love and a future life partner. A reversed Ace of Cups could suggest that an emotional or spiritual connection may not be uppermost on your list of priorities. Other things may be more important to you such as financial stability and security, status or position. Everyone’s needs are different in relationships and life-time partners. So too is their definition of love. What gives great joy to one, is insufficient for another. I am not saying any of the above is the case with you and I wouldn’t get too worried about strange cards as such as it depends on your mindset and emotional state at the time you did your reading. Perhaps you should do a reading based on what the Reversed Ace of Cups means for you in this position. Thank you for the insight . I think you are right about me having other priorities now subconsciously. Guess that’s why the strange card came this time . Makes everything clearer . Sometimes the tarot has a strange way of sharing its information with us.